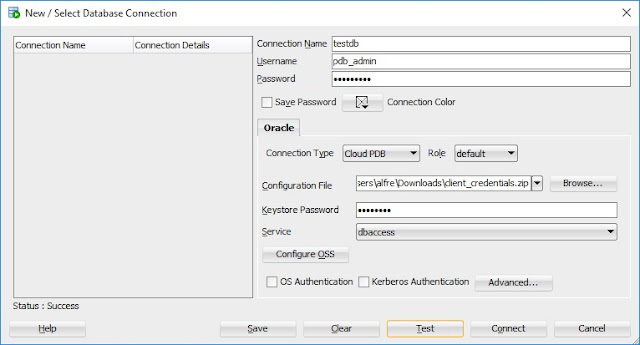 In my previous post (How To Connect To The Oracle Cloud Instance) we reviewed the steps to connect using SQL Developer. 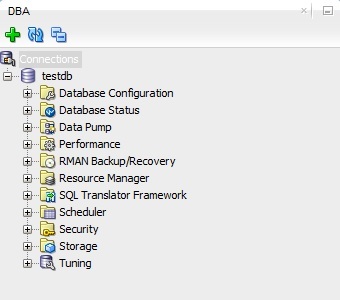 Now we will see what DBA tasks we can perform using SQL Developer. First click on the View menu, then click on the DBA sub menu. This is going to open the DBA pane in the lower left corner. Click on Connections and add the connection we already setup to the Oracle Cloud Instance. Here you can expand the tree to verify what is available from SQL Developer. Let's click on Tuning and then Real Time SQL Monitoring. The right pane is going to display the SQL Monitoring output. I'm really familiar to this feature in OEM 13c and honestly, looks very similar in SQL Developer. Now let's click on Instance Viewer under Database Status menu. This is going to show you the overall container status and statistics on where our PDB is running on. The storage menu can help you verify the size of your tablespaces and under RMAN Backup/Recovery you can verify that there are actually backups happening every night. In my previous post (How To Create An Oracle Cloud Instance) I showed you create your first Oracle Cloud DB instance. Now that the instance is there the question is, how to connect to it? Let's say you want to connect using SQL Developer to start creating objects and inserting data. First you need to enable the Client Access feature. Yes, it is disabled by default. Navigate to the Cloud DB instance dashboard. Click on Manage menu on the left side. Click on Admin Password and provide a password for the PDB_ADMIN account. Then click on Client Access and check the enabled flag, then save. It will show like this. Once this is enabled you need to download the Access Credentials in order to connect to your instance. Click on the Client Credentials button located on the right side of the Client Access one. This is going to prompt for a password (type one that you can remember) and it will download a .zip file containing these credentials and connect descriptors. Note: You don't have to unzip this file. Open your SQL Developer software and click on New Connection. Type a name for your connection. In the username & password you can either type the PDB_ADMIN username and password or the credentials for the newly created schema. In Connection Type select Cloud PDB and provide the downloaded .zip file along with the password provided (the one that you should remember). Click Save and then Connect. Now let's test our connection by executing a simple SQL statement. Using the Cloud DB instance dashboard you can create different schemas as needed. You just provide the username and password. At the end you just need to follow the same steps as we did before, just provide the username and password of the new schema. In my previous post (Thinking on trying the Oracle Cloud? My 30 day experience) I showed you how to subscribe to the Oracle Cloud and how to get to the main dashboard. From here we are going to click on the Create Instance button. After that you are going to be prompted on what kind if service this instance is for. 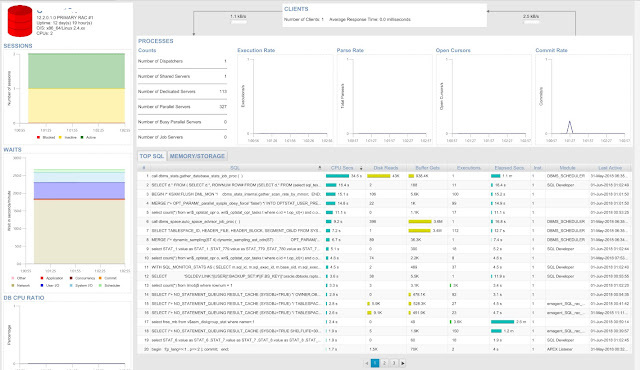 You have 4 options; Messaging, Data Visualization, Exadata Express and Management Cloud. In this example we want to create a database instance on Exadata Express. So we are going to select “Create” on the Exadata Express section. Then you need to configure the instance details. First is the name (lowercase), then the plan and finally the Database shape. In this case I just want to create a small 20GB test instance. On the right side you have administrator details. The default is the account we created to sign up to the Oracle Cloud. You will get a message like the one below. It took couple of minutes for the DB instance to be provisioned. Once ready, you’ll see the status of the instance as active in the dashboard. Next click on the service instance URL and you will be re-directioned to the instance dashboard. In this dashboard you have 2 main options, Develop and Manage. Develop option, gives you tools like SQLPlus, App Builder, SQL Developer and the option to enable access to client tools. Manage option enables you to create users, change passwords, export/import and Apex administration. This concludes the instance creation process. Thinking on trying the Oracle Cloud? My 30 day experience. Although I already had some exposure to the Oracle Cloud (thanks to other Oracle ACEs that put an awesome workshop last year at Collaborate 2017) , I decided to sign up for a free 30 day ($300 dollars credit) and test the Cloud out. The sing up process was kind of weird. You first go to https://cloud.oracle.com/home and click on the “Try for Free” green button in the right upper corner and then “Create Free Account”. Then you fill the formulary with all your personal data (account details), verification code (sent to your cell), credit card details (no charge will be made) and you need to agree the terms and conditions. You will receive an email after you submit your formulary. That night I received an email from Oracle that asked me to provide the name of the bank of my credit card and the amount that was charged to it. Yes, they charged and then they removed the charge. After asking them by email on how to provide this information, they responded that just by replying to that email with my information (seems pretty secure, right?). I received an email couple of hours later with my login credentials and the URL. Once you click on the hyperlink or type the URL provided, you are prompted to reset your password and then sent to the main dashboard. In my next post, I will show you how to create your first Cloud Database instance. with the same error. This is documented under bug 24489846. Follow the instructions on the MOS note id 2187877.1. I got an error during an TXK patch in a 12.2 EBS instance. This happened while executing file xdotmgen.ldt. Error: FAILED: file xdotmgen.ldt on worker 1 for product fnd username APPS. After looking at MOS Note Id 1953472.1, it turns out to be due to a couple of invalid objects in the database. The solution worked and were able to continue with the ADOP cycle. I recently had an issue with an OEM agent 12.1.0.4 version running on Solaris. Looks like there’s a Java related bug which causes the agent to consume high amounts of CPU in the box. But the interesting part is this only happens when Listeners are being monitored. If you blackout the Listener targets this stops. If this’s the case then you are hitting Bug 15953286. The solution is comprised by various steps outlined on MOS “EM 12c: Enterprise Manager 12c Cloud Control Agent CPU Spiking and High Utilization on Solaris with Many Database and Listener Targets (Doc ID 1536871.1)”. Amazon released a note late last year about Amazon’s RDS is now supporting Oracle Enterprise Manager Agents. Amazon RDS supports agent version 12 (12.1.0.5), 13R1 and 13R2 (13.2.0.0). You can use this to monitor your DB instances running on Amazon’s RDB but there are some limitations, like the fact you cannot execute jobs against those targets. See below for more information about this. Here’s a list of some useful emctl commands to manage your OEM 13c agent.